Today, for the first time, I stepped foot on Russian soil - an amazing thing since I truly grew up and came of age in the Cold War. 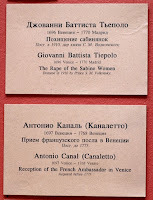 My family and I visited many remarkable places in St. Petersburg. While touring the Hermitage Museum we saw all kinds of works of art - lots of Monets, a room full of Rembrandts, and even two paintings by davinci, but the piece that most amazed me (and really took me by surprise), was "Reception of the French Ambassador" by Antonio Canal, also known, of course as "Canaletto". I'd studied this painting several times before, but never committed to memory the fact that it was located in a city I was going to be in today. It's big - much bigger than I'd imagined, and I snapped several close-ups of areas that interested me. The first thing to jump out of this painting, of course, is the presence of shiny gold ceremonial vessels. 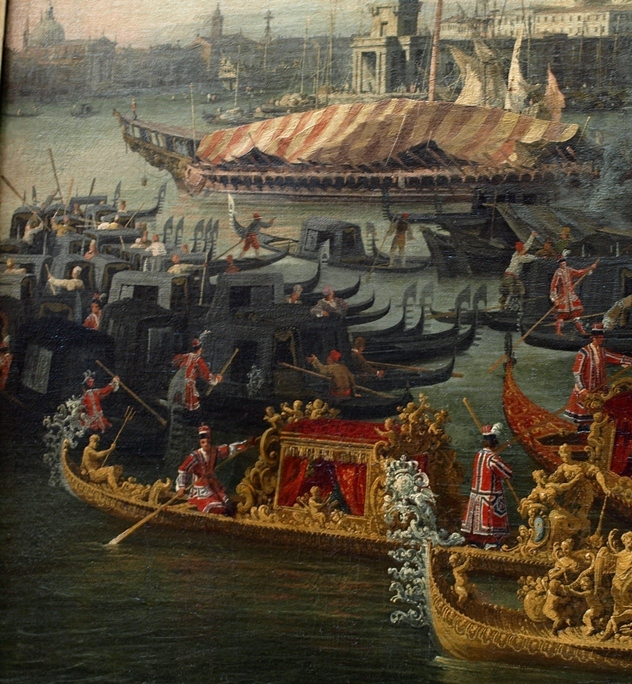 These were some of the most ostentatious things afloat back then. 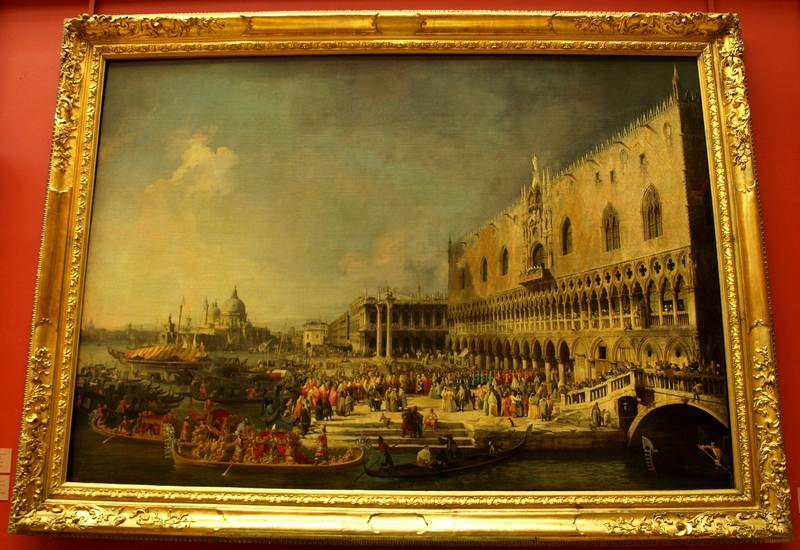 Nothing could compare to the Bucintoro, but if you were someone important (other than the Doge), this was the height of elegance. Everything on these boats, including the men rowing them, was top notch. 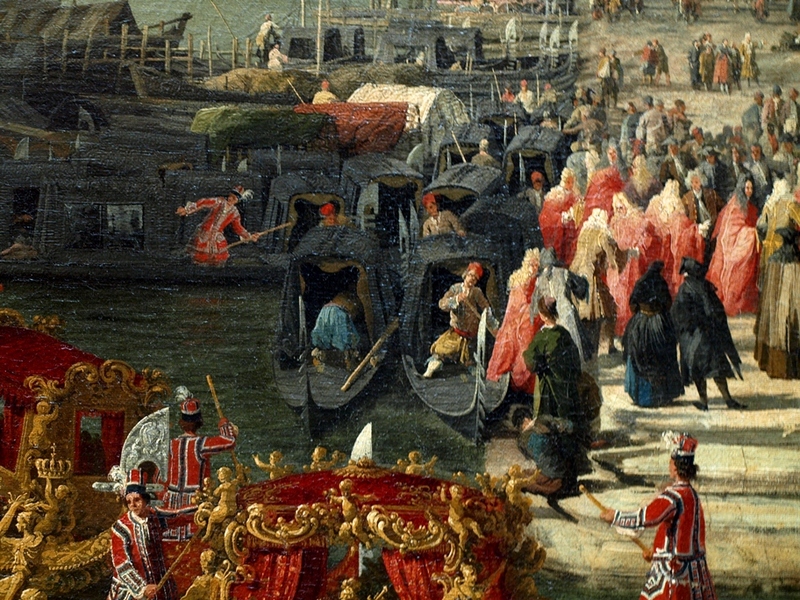 In the above image, we also get an idea of what a crowd of standard gondolas looked like back then – notice the abundance of covered boats and the larger ferro blades. Looking to the lower right-hand corner, we get another view of that ancient ferro design. 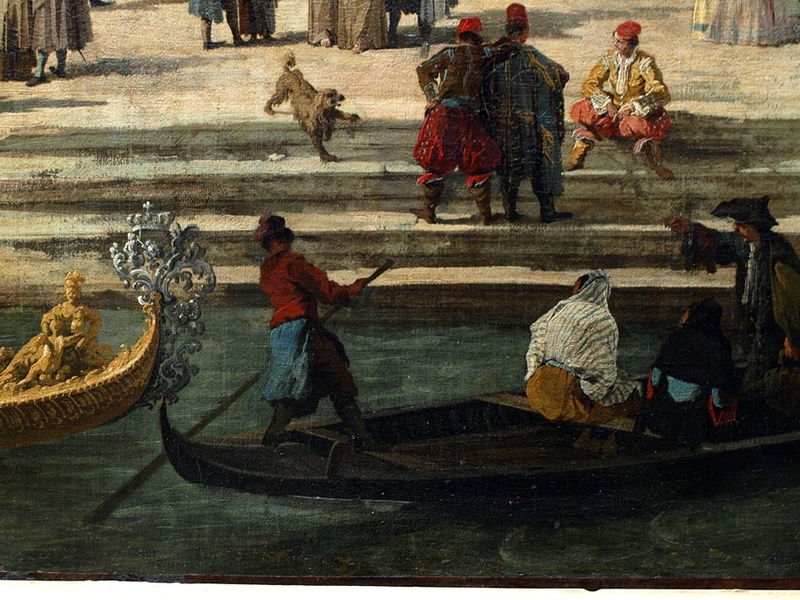 We also see that the boat entering the scene has a forward gondolier – not just one guy on the back. There’s a commotion at the edge of the fondamenta as passengers disembark and boat operators try to avoid collisions. 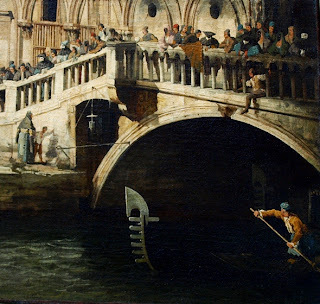 Speaking of collisions, I’d like to go back in time and thank Canaletto for not just painting a serene and tranquil piece – he added drama, and the best piece of drama is right there in the foreground. The guy rowing solo in the canal has his hands full. To begin with, he has moved his remo to the other side of the boat – not something gondoliers typically do, and he appears to be prying against the rail. Meanwhile, the male passenger (the one who he probably has to answer to) is trying to point something out to him. It looks as though the gilded vessel behind him is not headed in his direction, but he doesn’t need to be distracted at this point. 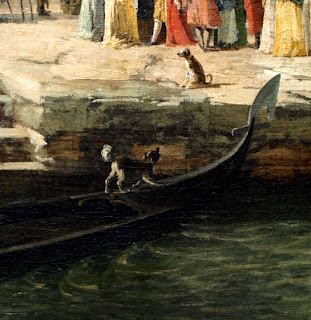 Because of his prying stroke, this gondolier appears to be spinning his bow right into the wall – I could be wrong, but the dog seems to notice it. He might actually be performing a tirare acqua stroke to pull the stern towards the mooring steps (although that’s an odd choice), the easier and smoother choice would have been a pry against the outside of the tail or even at midship. 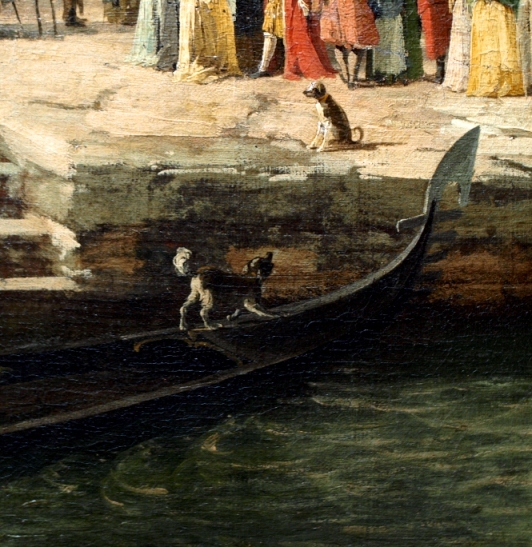 And yes, the dog may very well be simply barking at the other dog on shore, but as a gondolier, I look at this scenario as a moment of potential disaster. 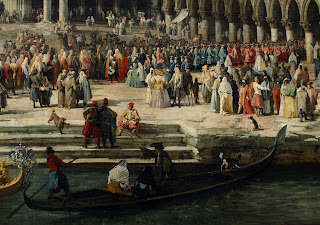 Beyond all the little observations, I must say that it was an amazing experience to find myself staring right at something so significant in both Venetian art, and gondola history. 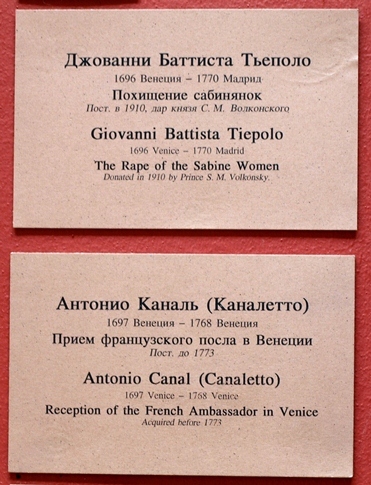 Эй, Грег, я в настоящее время 7 оттенков зеленого прямо сейчас. Какая удивительная поездка.Сообщение о весло вверх, если нужно.